An email went out to some unfortunate gamers from Best Buy notifying them that their pre-order of Majora’s Mask Limited Edition New Nintendo 3DS XL was cancelled. 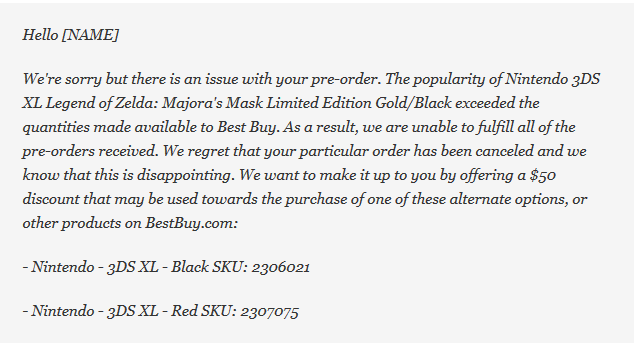 The reason stated for the mass cancellation is that “the popularity of Nintendo 3DS XL Legend of Zelda: Majora’s Mask Limited Edition Gold/Black exceeded the quantities made available to Best Buy.” This is the latest in cancellations from Best Buy as earlier this week they refunded customers who had purchased more than one copy of the system, leaving them with the pre-order limit of one. Hit the jump to find what Best Buy plans on doing for its disappointed customers and weigh in on what you think. 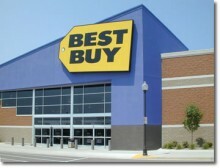 To appease their shoppers, Best Buy is offering a $50-off promotional code that can only be used at their website. In the email they suggest using the promo code to purchase a red or black New 3DS XL, but they do not restrict the usage to just that. It has been reported that the promotional codes have an expiration date and should be used within the next month. What do you guys think? Do you believe what Best Buy is doing is the right course of action for this situation? Or do you believe there should be more done on Best Buy’s part to make this up to their customers? Leave your thoughts in the comments below.